It's Thursday, which means it's time to once again celebrate Theme Park Thursdays. Here we post a photo from one of our theme park adventures in the past. This photo is from January 2006 and was shot at Walt Disney World, specifically the Magic Kingdom. Here I'm standing out in front of one of my favorite attractions, the Tiki Room. 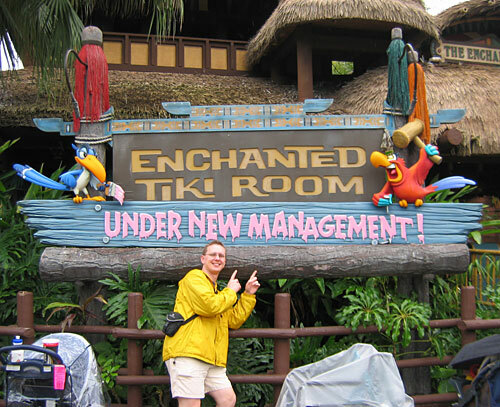 Unfortunately, since 1998 this attraction has been known as The Enchanted Tiki Room: Under New Management… and has been horrible. While the original attraction opened at Walt Disney World in 1971, it was rebooted in the late 1990s to make it "hip and edgy," mainly through the inclusion of Iago (from Aladdin) and Zazu (from The Lion King). The storyline was changed to these two birds being the "new owners," with a postmodern take on music and dialog to follow. In an interesting twist of fate, while I was at Walt Disney World for a conference in January, a fire broke out in the Tiki Room ceiling. It hasn't reopened since. There are rumors that maybe the show is being changed out to something else. Here's hoping! I didn't think the rebooted show was so bad. It had been 30 years since I saw the original version, so I had nothing to compare it to. Maybe I just appreciated the air conditioning. Anyway, I wonder if Gilbert Gottfried, who lost his AFLAC duck gig because of insensitive jokes about Japan after the quake/tsunami, will continue to voice Iago in any upcoming Aladdin-related Disney projects. Hey Friar, long time no see! Yeah, the original was somewhat long, and it was edited down over the years to prevent bored folks from leaving early. Which is why the show was rebooted with more relevant characters and a shorter runtime. There just isn't that much fascination these days with "robotic singing birds" as there was when this debuted. That said, the "Under New Management" show just seemed to poke fun at everything, including the Tiki Room itself, while shoehorning in songs that really didn't relate to an Adventureland theme. Tokyo Disneyland has a different show that features Stitch… though I'm not sure that would be an improvement. It will be interesting to see what, if any, changes are in place when WDW's version comes back online.